This high-powered annual—Building Momentum/Building the Future—layered several stories throughout. Designer: Baker | Brand Communications. Investing in the science of better medicine requires an enduring commitment of talent and resources, along with a willingness to explore new territories, whether in the laboratory or in the public arena. We currently are analyzing growth opportunities across the globe with the intention of expanding our marketing footprint to help even more people enjoy a better quality of life. We firmly believe that the Watson portfolio—distinguished by its excellence, efficacy and relevance—holds tremendous worldwide appeal. 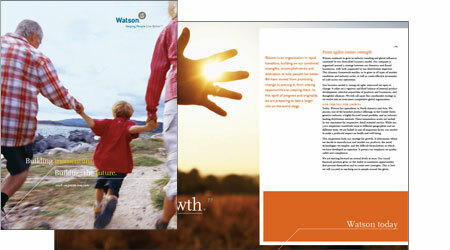 In the near future, we are weighing possibilities that will augment and globalize Watson’s marketing presence. We are well positioned for making inroads into attractive, high-growth markets. The Watson approach to better pharmaceuticals—calling on innovation, safety, affordability and quality—can benefit consumers in every corner of the globe. There are no geographic boundaries to illness or pain. There are no language barriers in the need for improved health and personal freedom or relief from worry and discomfort. This reality empowers us as we build tomorrow’s Watson.